It was a year of newcomers and nostalgia as carmakers from India and China gained notice while GM and Ford celebrated their heritages. In September, someone put photos of the still-secret Chevrolet Volt on a Web site accessible only to journalists. 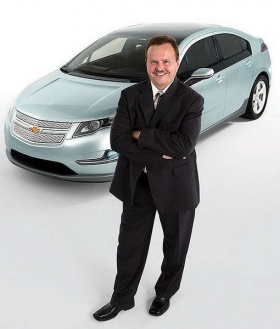 The Volt and vehicle line director Tony Posawatz appeared in the photos. Chevy later said it was a case of human error inside GM -- photos being sent where they werent supposed to go. 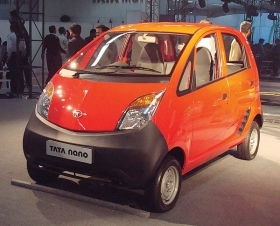 The Nano from Indias Tata Motors may have received more attention than any other car in the world in 2008. The two-cylinder Nano gained global interest because Tata expected to sell it to dealers for about $2,500. But because of plant-construction problems, the cars were being built on temporary lines at Tata plants at the end of the year -- a move that will increase costs but avoid a long delay in the Nano introduction. 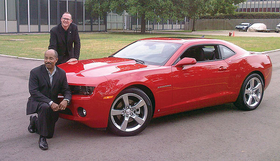 In July, General Motors global design boss Ed Welburn, left, and Chevrolet chief Ed Peper showed off the 2010 Chevrolet Camaro, which goes into production in February. 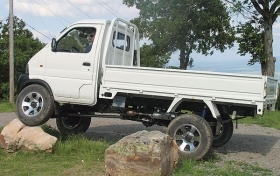 A pickup for $4-a-gallon fuel? The Tiger Champ gets 37 mpg with a three-cylinder diesel engine from Caterpillar Inc. It is assembled in Oklahoma. In June, Oklahoma Gov. Brad Henry signed a bill that makes the Champ and a small Tiger Truck pickup, the Star, legal on all roads in Oklahoma except most federal highways. The two pickups were designed by a Chinese automaker, Chongqing Changan Automobile Co.
A new brand of Chinese vehicles suitable for golf and retirement communities landed in the United States. 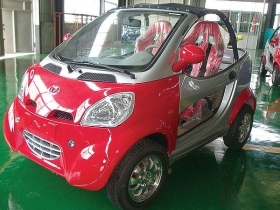 Kandi vehicles, which cannot be driven legally on highways, began arriving through a Seattle import company, Solus International Corp. Solus gets the vehicles from Zhejiang Kangdi Vehicles Co. In July, more than 1,000 Model T enthusiasts celebrated the cars 100th anniversary in Richmond, Ind., at T Party 2008, a weeklong bash hosted by the Model T Ford Club of America. 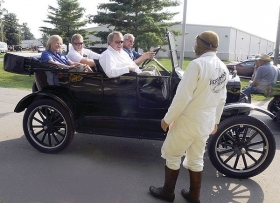 Edsel Ford II, in the front passenger seat, and his son, Henry Ford III, in the rear seat, get a ride in a Model T from Jay Klehfoth, CEO of the Model T Ford Club of America, and his wife, Barbara. General Motors celebrated its centennial at the Pebble Beach Concours dElegance with the display of 20 of the automakers long-ago Motorama concept cars. The 1956 Buick Centurion featured a novel parking aid: a camera linked to a TV screen in the center of the instrument panel. 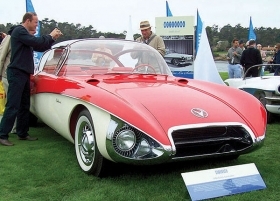 The 1956 Firebird II Titanium had a titanium body that required difficult special welding and bonding. The 1954 Pontiac Bonneville Special hinted at a Chevrolet Corvette competitor. It never happened.